New Year's Eve is a night for saying goodbye to the old and hello to the new, something the Danes certainly know how to do with aplomb. While big cities like Copenhagen and Aarhus will be filled with throngs of partygoers, New Year is for many Danes a chance to show that home is where the heart is, as close friends gather to follow time-honored – and sometimes rather bizarre – traditions. Here are some of the pillars of many a Danish New Year celebration. Also known as 'Dinner for One', this ancient black-and-white comedy sketch is shown year after year in Danish homes as the old year ticks to a close. No matter what else you do on New Year's Eve in Denmark, there is one thing nearly all parties have in common: an 11-minute television interlude to watch 'Dinner for One'. Virtually unknown in the rest of the world, the British-made skit from 1963 is loved in Germany and Scandinavia – not least in Denmark. Click the YouTube video to the right to watch the sketch. The Queen's New Year's speech in 2016. For the majority of Danes, it is Queen Margrethe’s New Year’s Eve speech that signals the beginning of a night of the same old festivities. Starting at 6 pm sharp with a live broadcast from Fredensborg Castle, for many this is the starting pistol which legitimately starts the drinking, and you only have about six hours to wait before the strike of midnight, so hurry! Her Majesty's speech has been an annual staple since its advent by King Christian IX back in the 1880s. It has come to symbolise unity for the country, and gained stature during the Nazi occupation of Denmark when the speech came to represent a rallying cry for the country against the occupying German forces. Even today, the queen still takes this opportunity to summarise the year’s major political events, both global and local, and always gives a nod of thanks to the people of Greenland and the Faroe Islands. In recent times, bookies have started monetising this royal occasion, taking bets on which current events from the past year will make it in to Her Majesty's speech. In 2011, 'Justin Bieber' and 'happy slapping' had odds of 50 to 1. On second thoughts, perhaps predicting the Queen's speech is just a feature of Danish New Year's parties attended by the locals. One thing is certain, though – once she signs off with her customary "God save Denmark" (Gud bevare Danmark) line, it will be time for dinner. Danish Kransekage. The traditional New Year’s Eve menu is boiled cod, or stewed kale with cured saddle of pork. 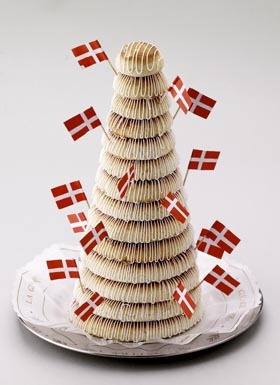 Many Danes party at midnight with champagne and marzipan ring cake (Kransekage) while wearing paper hats, throw streamers, light sparklers and blow up balloons to constitute the traditional New Year’s decorations. When the big moment comes, many people will get up on a chair so that they can literally jump into the new year. Of course, there’s nothing wrong with planting a big wet smooch on the person next to you – even better if you actually know them. Once the clock approaches 8-9 pm, a steady flow of fireworks will begin by those impatient souls who can’t wait for the chimes of midnight. And we’re not talking about professional firework shows here, but rather the private arsenal of Danes who spend the evening firing off impressively sophisticated rockets. The climax of the celebration is the fireworks launched as the Copenhagen Town Hall Tower bells chime on the stroke of midnight, which marks the start of the new year. Thousands of people gather together in 'Rådhuspladsen' (the Town Hall Square) in Copenhagen and cheer. The Royal Guard parade in their red gala uniforms. The celebrations generally go on past midnight into the early morning hours. For those out and about, the party can easily run until the sun rises on New Year's Day and all of those New Year's resolutions beckon. For those that aren't spending their New Year's Day hungover in bed, watching skiskydning (biathlon) and eating day-old Kransekage, you can tune into the Prime Minister's speech at 7.15 pm. It is one of the longer-established customs, dating back to 1940 when the then Prime Minister, Thorvald Stauning, gave the very first New Year’s address by radio transmission in light of the Second World War. Nowadays, the address takes the form of a lengthier discussion, recapping on the year in politics. It is followed by some extensive post-speech analyses by the political pundits on TV. In 2018, Lars Løkke Rasmussen took the stand and he has given the address several times before as Prime Minister during previous terms, so he should hopefully know the drill by now. If you are interested in politics, now is the time to meet up with Danish friends in front of the TV for a post-New Year low key get together. Test some political arguments, and get rid of some of the left overs from last night’s festivities.